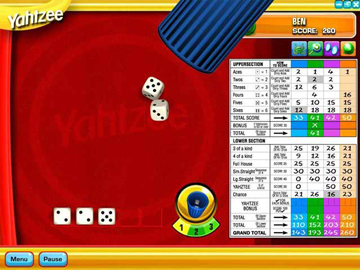 Home | Download Games | Yahtzee! Roll your way to fast fun with this amazing version of the classic game that's been a family favorite for over 50 years. Throw the dice to build straights, full houses, five of a kind - YAHTZEE! - in three exciting game modes featuring a host of great ways to play. 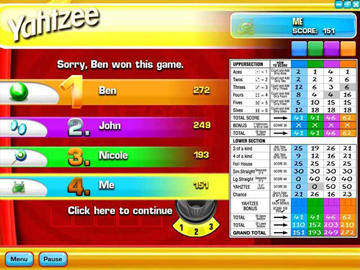 Go for the high score in Solitaire, challenge the computer, or face-off against family and friends in Yahtzee or Triple Yahtzee. 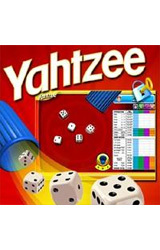 Help your hand or hinder your opponents with original power-ups and reach for the celebrated rank of Grandmaster in the all-new Power Yahtzee mode. 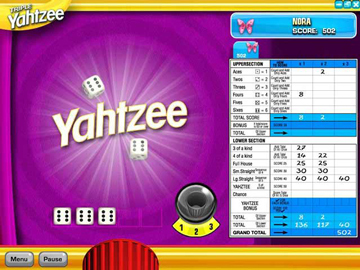 The first game to make thinking fun, Yahtzee is now the ultimate way to shake and score.